Attractive in its simplicity, the Indian Head penny is a timeless piece of American coinage and is a foundational series in the coin collecting community. The Indian Head penny was the second small cent after the Flying Eagle cent, and it was first struck in 1859. Like its predecessor, the Indian Head penny was designed by James B. Longacre. 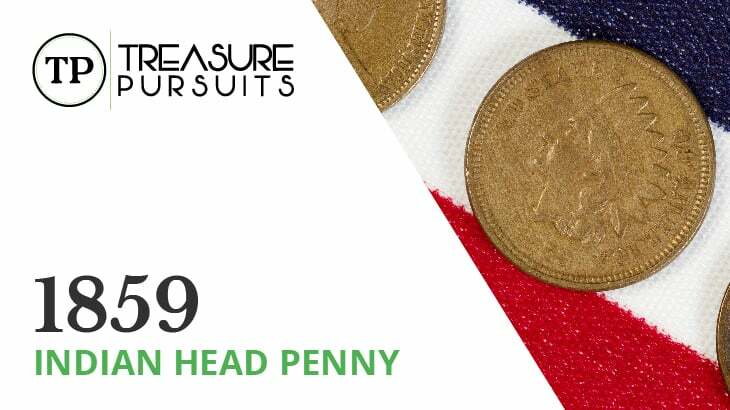 The obverse design consists of a profile bust portrait of Miss Liberty wearing a Native American-style feather headdress with the legend “UNITED STATES of AMERICA” and the year of mintage running along the rim. The name “Indian Head penny,” while technically inaccurate, remains the most popular way to refer to this coin. The reverse design centers on the denomination “ONE CENT,” which is surrounded by a wreath. The 1859 issue uses a simple laurel wreath, whereas all subsequent issues use an oak wreath with a shield at the top and a bundle of arrows at the bottom. Both faces make use of a denticled rim, or a rim composed of small bumps. The edge is plain. There are two composition types for the Indian Head penny. The first type was used from 1859 to 1864 and consisted of 88% copper and 12% nickel, with a diameter of 19 millimeters and a mass of 4.67 grams. The second type was 95% copper and 5% tin and zinc with a mass of 3.11 grams. This composition was used until 1909, the year that the Indian Head penny was replaced by the Wheat penny. 1859 was the very first issue of the Indian Head penny, and it is unique among the series in terms of its design. The 1859 reverse face, as mentioned in the overview, bears a simpler design than later issues, consisting only of a laurel wreath and the denomination. As this was altered in the 1860 issue, the 1859 Indian Head is a one-year-only type coin. Cents were only struck in Philadelphia this year and would not be struck elsewhere until 1907, so this issue displays no mint mark. A rather large 36,400,000 pennies were struck in 1859, a number which reflects the mint’s desire to replace the cent pieces that had been in use previously. These coins are generally well-struck, especially compared to the Flying Eagle cent, and they are somewhat common in grades below MS-65. However, gem examples are hard to come by and can command high premiums. Additionally, this issue contains several die-punching varieties that have gained attention from collectors. Having been struck before 1865, the 1859 Indian Head penny utilizes the copper-nickel composition and has a mass of 4.67 grams. Because the copper content is lower than later issues, the 1859 Indian Head penny is not typically subject to the Brown, Red-Brown, and Full Red color designations. One quirk found in coins produced under James Longacre, especially Indian Head pennies, is what is known as Longacre doubling. Longacre doubling usually manifests as a sort of lip or shoulder found on both sides of the design elements that resembles a doubled die effect. It is most commonly seen on the obverse lettering of Indian Head pennies. Whereas a doubled die is the result of a hubbing error on an individual die that then gets struck onto the coins, Longacre doubling is the result of intentional modifications made to the master die in order to extend the life of the dies or to perfect a design. Whatever the cause, Longacre doubling does not typically add value to a coin and should not be mistaken for a doubled die variety. The main distinguishing factor is that Longacre doubling can be seen on both sides of the design elements, while a doubled die effect is only seen on one side. Despite its commonality, the 1859 Indian Head penny has the benefit of being a first issue and a one-year-only type, so it has fair values at most grades. Good-4 grade examples are worth $15, Very Good-8 grades are worth $21, and Fine-12 grades are worth $25. This is the most likely range for an average specimen. The value increases quickly to $57 in Very Fine-20, $109 in Extremely Fine-40, $205 in About Uncirculated-50, $284 in Uncirculated (MS-60), and $594 in Uncirculated (MS-63). MS-64 examples are valued at $1,600, and MS-65 grade coins jump to $3,700. MS-66 specimens carry a value of $8,850, and MS-67 examples may bring as much as $34,500. Proof strikes may be worth anywhere from $1,656 to $5,200 depending on their condition.